Abstract: Autonomous Surface Vessels (ASVs) have various applications in the marine sector. However, considerable challenges need to be met before in-tegrating the applications in the current environment. Moreover, infrastructures in ports and waterways need to be upgraded to satisfy the requirements for ASV applications. To have an insight into the potential of ASVs in ports, we analyze the applications of autonomous vessels and the impacts which these applica-tions may have on port infrastructures. Future scenarios of the application of ASVs in ports are determined based on the analysis of the following three as-pects: ASV applications, ASV technology development, and port infrastructure development. To indicate the development of ASV technology and port infra-structures, the Technology Readiness Level (TRL) is employed. 11 scenarios of ASVs in ports have been identified according to the previous analysis. The for-mulated scenarios can be used further to have a detailed understanding of the impacts it would have on the port and society. Reference: A. Devaraju, L. Chen, R.R. Negenborn. 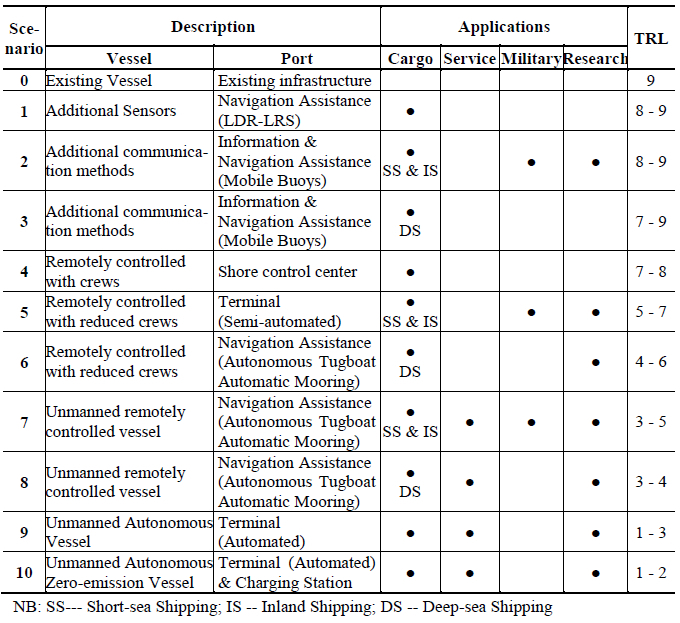 Autonomous surface vessels in ports: Applications, technology and port infrastructures. Accepted for the 9th International Conference on Computational Logistics (ICCL 2018), Vietri sul Mare, Italy, October 2018.